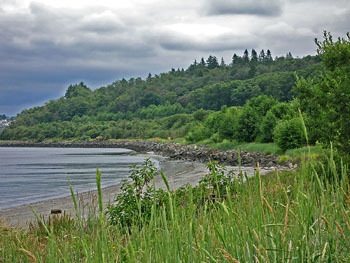 Discovery Park is the largest park in the city of Seattle with 534 acres. Operated by the Seattle Parks and Recreation Department, Discovery Park contains sandy beaches, rocky intertidal lands, freshwater ponds, forested wetlands, forests, meadows, streams, and thicket habitats. The large size and varied habitats make it an ideal place to view over 270 species of birds, just three miles north of downtown Seattle. The open salt water visible from West Point hosts many wintering birds - a flock of 300-plus Western Grebes, Red-throated and Common Loons, Marbled Murrelets, and Rhinoceros Auklets. Five common species of gull use the beach all winter, while fall is a good time for viewing Parasitic Jaegers harassing Bonaparte's Gulls and Common Terns. Spring brings Brant Geese to feast on the eelgrass. Spring- and fall-migrating shorebirds, such as Surfbirds and Ruddy and Black Turnstones, use the rocky beach, while Sanderlings remain all winter. Freshwater areas are excellent for viewing American Wigeon, Northern Shovelers, Hooded Mergansers, and Bufflehead during the winter months. Gadwalls, Red-winged Blackbirds, and three species of swallows are common during the summer. Observant birders may find Green Heron and Purple Martins. Yellow-rumped Warblers can be seen during the winter months near the North Beach Wetlands. The mixed coniferous-deciduous forests areas are home to nesting Barred Owls and wintering Great Horned and Saw-whet Owls. Hutton's Vireos can be found nesting at the forest edge along with Rufous Hummingbirds and Pileated Woodpeckers, while Western Tanagers, Pacific-slope Flycatchers and Townsend's Warblers visit the forested ravines. Mixed feeding flocks contain Chestnut and Black-capped Chickadees, Ruby and Golden-crowned Kinglets, with Downy Woodpeckers and Red-breasted Nuthatches. Bald Eagles have nested in past years within and on the edges of the park. Accipiters hunt and nest in the forest and thicket edges, near Olive-sided Flycatchers. Red-breasted Sapsucker is an occasional winter visitor. Barn Owls patrol the South Meadows. Savannah and White-crowned Sparrows nest here, while the winter brings Fox, Lincoln, and Golden-crowned Sparrows. Thickets are particularly good areas to observe Anna's Hummingbirds year round. The meadow also has attracted such rarities as Loggerhead Shrike, Lazuli Bunting, Snow Bunting, and Say's Phoebe. Heading north on I-5, take Exit #167 at Mercer Street. Turn right at first stoplight, then left at next set of stoplights. Stay in the far right lane that merges onto Westlake Avenue North. Follow Westlake to Nickerson Street. Go straight on Nickerson Street toward Seattle Pacific University. Stay in the left lane and follow signs to Ballard Bridge/Emerson Street. At a three-way stop, take a left. At the next stop sign, take a left and follow Emerson to a four-way flashing stop. Take a right onto West Gilman. West Gilman becomes West Government Way. Follow this to the east entrance of the park. The Environmental Learning Center is the first left. Heading north on Highway 99, take the Western Avenue exit. Head north on Western to Elliott. Elliott becomes 15th Avenue West. Follow 15th to the Dravus Street exit. At the stoplight, take a left onto Dravus. Turn right onto 20th Avenue West. This arterial eventually becomes West Government Way. Follow this to the east entrance of the park. The Environmental Learning Center is the first left. From Downtown Seattle, go west on Denny Way to Elliott. Then follow the directions from Elliott, as above. Discovery Park is served by Metro Bus Lines #33, #19, #24. Access to birding areas within Discovery is by foot, as vehicle access is restricted. The Loop Trail is a 2.8 mile loop around the uplands through meadow, thicket, and forest. The beach area can be reached via the North Beach Trail or the South Beach Trail. Maps of Discovery Park are available at the Environmental Learning Center at the east entrance of Discovery Park. For additional information call 206-386-4236, or visit on-line at the City of Seattle web page.